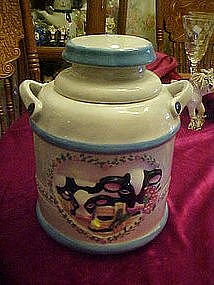 Cute hand painted glazed ceramic cookie jar in the shape of a milk can. A hert on the front with pink roses border. Inside the heart are two cows. Measures almost 9" tall very cute and no damages. I will be listing the matching milk bottle shakers too.Stamped BHP Copyright NY.